[S61] 1930 United States Federal Census, online , Year: 1930; Census Place: Throop, Cayuga, New York; Roll: 1411; Page: 2A; Enumeration District: 59; Image: 1142.0; FHL microfilm: 2341146. [S11] 1910 United States Federal Census, online , Year: 1910; Census Place: Montezuma, Cayuga, New York; Roll: T624_928; Page: 9B; Enumeration District: 0049; Image: 824; FHL microfilm: 1374941. [S26] 1900 United States Federal Census, online , Year: 1900; Census Place: Montezuma, Cayuga, New York; Roll: T623_1013; Page: 9A; Enumeration District: 34; FHL microfilm: 1241013. [S11] 1910 United States Federal Census, online , Year: 1910; Census Place: Montezuma, Cayuga, New York; Roll: T624_928; Page: 6B; Enumeration District: 0049; FHL microfilm: 1374941. [S85] Montezuma Birth Records, online <http://web.archive.org/web/20001110085900/http://…>, Pratt, Chase Ray (m) Nov 10, 1888 Montezuma Clara Carner (19) Montezuma David S. Pratt (23) Farmer Mentz NY. [S85] Montezuma Birth Records, online <http://web.archive.org/web/20001110085900/http://…>, Pratt, Mary Elizabeth (f) Aug 8, 1896 Montezuma Clara May Carner (27) Montezuma David Pratt (30) Farmer Brutus NY. [S85] Montezuma Birth Records, online <http://web.archive.org/web/20001110085900/http://…>, Pratt, (m) Mar 1, 1895 4-3 Montezuma Clara F. Carner (25) Montezuma David S. Pratt (28) Farmer Brutus NY. [S26] 1900 United States Federal Census, online , Year: 1900; Census Place: Rochester Ward 12, Monroe, New York; Roll: 1075; Page: 22A; Enumeration District: 0083; FHL microfilm: 1241075. Edna Hurd Robert Jarvis Lillian Pinchback Widow. Source Citation: Year: 1920; Census Place: Rochester Ward 9, Monroe, New York; Roll: T625_1121; Page: 6B; Enumeration District: 102; Image: 1093. [S66] 1925 New York, State Census, online , New York State Archives; Albany, New York; State Population Census Schedules, 1925; Election District: 01; Assembly District: 01; City: Montezuma; County: Cayuga; Page: 3. [S62] Ancestry.com, Social Security Death Index (n.p. : Online publication - Provo, UT, USA: Ancestry.com Operations Inc, 2011.Original data - Social Security Administration. Social Security Death Index, Master File. Social Security Administration.Original data: Social Security Administration. Social Security D, unknown publish date), Number: 109-14-2424; Issue State: New York; Issue Date: Before 1951. [S74] The Citizen Advertiser, Auburn, NY, Oct 4, 1972 Mrs. Mary O'Hara Young of 5 Washington St., died Tuesday in Mercy Hospital after a long illness. Mrs. Young was a native of Ireland and had lived in Auburn since childhood. Surviving are six grandaughters, Mrs. Sam (Jean) Valenti of Rochester,'Mrs. Charles (Marion) Brown of Saratoga Springs, Miss Virginia Young of Montezuma, Mrs. Laura Michalow of Port Byron, Mrs. Horace (Jean) Carner and Mrs. Donald (Nancy) Smith of Montezuma; 13 great-grandchildren and one great-greatgrandchild. Services will be at 9 p.m. Thursday at the Farrell Funeral Home with the Rt. Rev. Msgr. James D. Cuffney officiating. Burial will be in St. Joseph's Cemetery. Friends may call at the funeral home from 7 to 9 p.m. Thursday. [S2] 1880 United States Federal Census, online , Year: 1880; Census Place: Port Byron, Cayuga, New York; Roll: 814; Family History Film: 1254814; Page: 171C; Enumeration District: 028; Image: 0264. [S61] 1930 United States Federal Census, online , Year: 1930; Census Place: Auburn, Cayuga, New York; Roll: 1410; Page: 15A; Enumeration District: 5; Image: 1046.0; FHL microfilm: 2341145. [S69] 1940 United States Federal Census, online , Year: 1940; Census Place: Mentz, Cayuga, New York; Roll: T627_2508; Page: 1B; Enumeration District: 6-56. Daniel McNamara married an unknown person. [S26] 1900 United States Federal Census, online , Year: 1900; Census Place: Ellsworth, Meeker, Minnesota; Roll: 775; Page: 3A; Enumeration District: 0107; FHL microfilm: 1240775. [S11] 1910 United States Federal Census, online , Year: 1910; Census Place: Ellsworth, Meeker, Minnesota; Roll: T624_694; Page: 2A; Enumeration District: 0087; FHL microfilm: 1374707. [S925] Ancestry.com, Minnesota, Territorial and State Census, 1849-1905 (n.p. : Ancestry.com Operations Inc, unknown publish date). [S65] 1920 United States Federal Census, online , Year: 1920; Census Place: Ellsworth, Meeker, Minnesota; Roll: T625_845; Page: 6A; Enumeration District: 120; Image: 188. [S1] 1870 United States Federal Census, online , Year: 1870; Census Place: Montezuma, Cayuga, New York; Roll: M593_911; Page: 493A; Image: 180; Family History Library Film: 552410. [S11] 1910 United States Federal Census, online , Year: 1910; Census Place: Montezuma, Cayuga, New York; Roll: T624_928; Page: 3A; Enumeration District: 0049; Image: ; FHL microfilm: 1374941. [S65] 1920 United States Federal Census, online , Year: 1920; Census Place: Montezuma, Cayuga, New York; Roll: T625_1090; Page: 6B; Enumeration District: 38; Image: 17. [S26] 1900 United States Federal Census, online , Year: 1900; Census Place: Montezuma, Cayuga, New York; Roll: T623_1013; Page: 10B; Enumeration District: 34; FHL microfilm: 1241013. [S11] 1910 United States Federal Census, online , Year: 1910; Census Place: Montezuma, Cayuga, New York; Roll: T624_928; Page: 1A; Enumeration District: 0049; Image: 807; FHL microfilm: 1374941. [S34] 1865 New York Census, Record Type: New York State Census, "New York, State Census, 1865," images, FamilySearch (https://familysearch.org/pal:/MM9.3.1/TH-266-11685-40736-95 : accessed 29 Oct 2013), Cayuga > Montezuma > image 11 of 28. [S44] Town of Montezuma Records, online http://web.archive.org/web/20020215005729/http://…, (Waybackmachine), Dennis, Mary Aug 30, 1913 53 Montezuma Matthew McNamara Mary. [S26] 1900 United States Federal Census, online , Year: 1900; Census Place: Montezuma, Cayuga, New York; Roll: 1013; Page: 8A; Enumeration District: 0034; FHL microfilm: 1241013. [S65] 1920 United States Federal Census, online , Year: 1920; Census Place: Montezuma, Cayuga, New York; Roll: T625_1090; Page: 6A; Enumeration District: 38; Image: 16. [S11] 1910 United States Federal Census, online , Year: 1910; Census Place: Montezuma, Cayuga, New York; Roll: T624_928; Page: 3A; Enumeration District: 0049; FHL microfilm: 1374941. Catherine O'Donnell was born circa 1825 at Ireland.1 She was born circa 1826 at Ireland.2 She married Robert Cullen, son of Robert Cullen and Mary Adams. 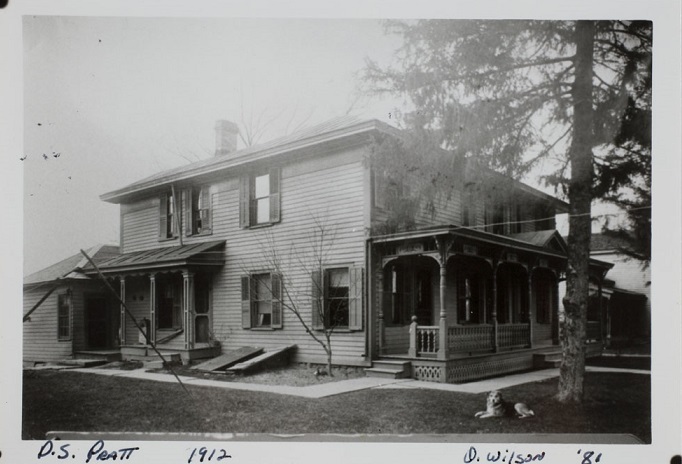 Catherine O'Donnell lived in 1870 at Mentz, Cayuga, New York, USA.2 She lived in 1880 at Mentz, Cayuga, New York, USA.1 She lived in 1920 at Mentz, Cayuga, New York, USA. Mary Adams married Robert Cullen. Robert Cullen married Mary Adams. [S2] 1880 United States Federal Census, online , Year: 1880; Census Place: Seneca Falls, Seneca, New York; Roll: 932; Family History Film: 1254932; Page: 206C; Enumeration District: 164; Image: 0132. [S26] 1900 United States Federal Census, online , Year: 1900; Census Place: Rochester Ward 3, Monroe, New York; Roll: T623_1073; Page: 1B; Enumeration District: 38; FHL microfilm: 1241073. [S9] Ancestry.com, 1860 United States Federal Census (n.p. : Online publication - Provo, UT, USA: Ancestry.com Operations, Inc., 2009. Images reproduced by FamilySearch.Original data - 1860 U.S. census, population schedule. NARA microfilm publication M653, 1,438 rolls. Washington, D.C.: National Archives and Records, unknown publish date), Year: 1860; Census Place: Montezuma, Cayuga, New York; Roll: ; Page: 740; Image: 263.